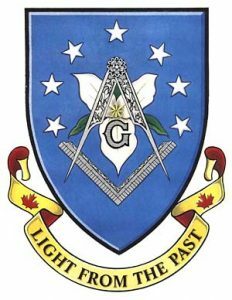 ­ The Grant of Arms was issued to The Masonic Heritage Corporation by Robert D. Watt, Chief Herald of Canada, The Canadian Heraldic Authority, September 1, 1998. The blue shield, typical of that carried by the knights of the Middle Ages, is used to support the armorial bearings of The Heritage Lodge. The Square and Compasses are recognized the world over and symbolize the universality of Freemasonry. The letter ‘G’ in it’s center represents the Great Architect of the Universe, and the Supreme Being of the various religions of the world. The floral Trillium with its three white petals and three green leaves represents the floral emblem of the Province of Ontario. The numeral three is the most significant number in Freemasonry representing, among others, the three theological virtues, faith, hope, and charity; and the three grand masters who bore sway at the building of the temple at Jerusalem namely Solomon King of Israel, Hiram King of Tyre, and Hiram Abiff. The number three also represents the three important architectural pillars of a lodge: Ionic – representing wisdom, Doric – representing strength, and Corinthian – representing beauty. The constellation of seven stars represent the seven liberal arts and sciences namely: Grammar, Logic, Rhetoric, Arithmetic, Geometry, Music, and Astronomy. The two red maple leaves on the motto ribbon are symbols of the Dominion of Canada, and the lodge motto is “Light From The Past”. The colours are Blue – Symbol of universal friendship and benevolence, and as it is the colour of the vault of heaven, which embraces and covers the whole globe, we are thus reminded that in the breast of every brother these virtues should be equally as extensive; it is also the dominant colour of Freemasonry. Yellow – Symbol of wisdom and adopted as the representative of the sun and of the noble metal gold. Red – Symbol of fervency and zeal and a common colour in the concordant bodies of Masonry. White – which also represents the metal silver, is the symbol of purity and innocence, and among the Ancients it was the symbol of the regeneration of the soul, they always imagined the deity clothed in white as the colour of absolute truth. Black – Symbol of grief and the garment of mourning; it is often tempered with humility. Black is also a symbol of silence and secrecy. Green – Symbol of hope and immortality. The evergreen of the Acacia is emblematical of a new creation of the body, and a moral and physical resurrection. Only the Coat of Arms is registered, as the Heraldic Authority does not allow words or phrases except as a ‘Motto’; therefore the Lodge Banner was created using the registered Coat of Arms and adding a top and bottom caption. The top caption identifies the Lodge and the Grand Register under which it was Instituted, and the date of Institution; while the bottom caption indicates that the principle function of the Lodge is “Research and Education”. The Lodge Banner is used primarily as a means of identification, as over sixty percent of the Lodge Meetings are held as the guest of a host lodge or other venue on special occasions. 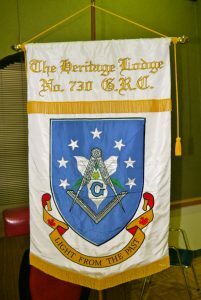 When a Regular Meeting is held at the invitation of another Lodge, the entire program is under the direction of The Heritage Lodge; therefore it is desirable to display the Lodge Banner in a prominent position in the meeting room. The Lodge Banner will be displayed on a standard with a cross arm and a free hanging golden sash with tassels.